In today's rapidly changing business world, organization's must be agile and have the ability to quickly (and accurately) change to remain competitive. Naturally, the nature and number of changes required will vary from one organization to another. One business may need to upgrade its software or add a new product line while another may need to divest itself of a product, abandon a geographical territory, outsource specific non-core functions, restructure reporting relationships, or replace talent in key positions. Whatever changes an organization needs to make, how those changes are executed will profoundly affect the value of the change and the organization's future success. Some organizations have become masters at organizational transformation and today benefit from a kind of agility and nimbleness that allows them to move quickly and exploit new opportunities while their competition is caught flat-footed, still churning in a planning or decision making mode. Although some organizations are quick to detect new opportunities and can even identify their own change requirements, poor implementation may impede the changes needed. In other words, the organization knows what needs to done but can't do it fast enough or complete enough. In these organizations, managers typically lament about getting "mixed signals" or of not getting "timely resources to make the necessary changes." Meanwhile front-line employees complain about a "lack of communication on what's really happening", spin their wheels, or even deliberately resist the change in deference to the old and familiar ways of doing business. Many organizations faced with change today are inclined to underestimate the impact of change on people and the amount of communication required to properly transform an organization. As James Champy noted in his book, Re-Engineering Management, "To deal with change we must deal with real emotions like fear and anger. Most managers don't have this experience. Two-thirds of all re-engineering efforts have not worked because of a failure to deal with the human issues." Reorientation: Where people learn the details of what it changing, why, and how the change(s) will affect them. Restoration: Where people have opportunity to discuss their needs, feelings and reactions to the change(s). Realignment: Where people learn how to adjust to and assimilate the change(s). Recommitment: When people feel they are ready to embrace the change(s) and can rededicate themselves and fully support the change(s). Unfortunately many leaders and managers today ignore one or more of these stages when introducing organizational changes. This may result in mass confusion, hurt feelings, and either passive or brazen resistance rather than a willingness to accept and move forward. Too often leaders and managers announce a change and then expect complete "buy in" from their followers (Stage 4) without fully appreciating or allowing people sufficient time to work through the first three stages of Reorientation, Restoration, and Realignment. In order to remain competitive today, businesses must be extremely agile and capable of rapid change and redeployment. 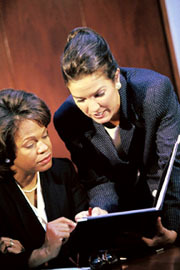 Leaders and managers that truly understand the impact of change on people and use an organizational transformation process will have followers that follow and thereby increase their organization's ability to perhaps change direction and move forward quickly either in reaction to a situation or perhaps to seize an opportunity and gain a "first mover" advantage.